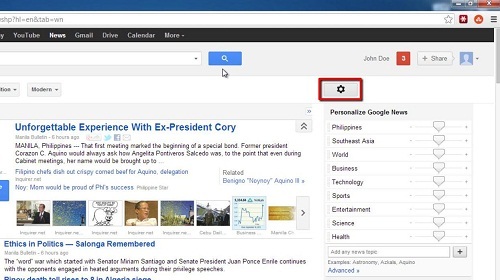 In this tutorial you are going to learn how to remove google news section which will leave you with a more customized news experience. 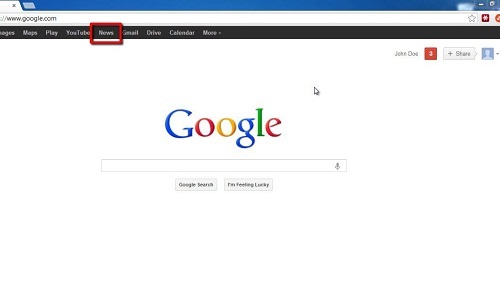 Go to the Google homepage and make sure you are signed into your account – if you are your username will be visible in the top right of the window. In the black bar at the top of the screen you will see a number of different options, click on “News”. 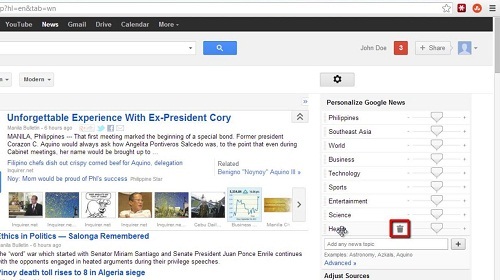 You will be redirected to your news homepage, which shows news customized to your preferences. At the top right of the screen you will see an icon that looks like a cog, click on this. Below the cog will appear a number of sliders which allows you to customize your news feed. The final stage in learning how to remove google news section is to actually delete one or more of these sections. For example, you may not want to receive “Health” news so to remove this, hover your mouse over the selection and click on the bin icon that appears. You can repeat this process for any other sections you want to remove.